Don’t know what to do with all that zucchini? 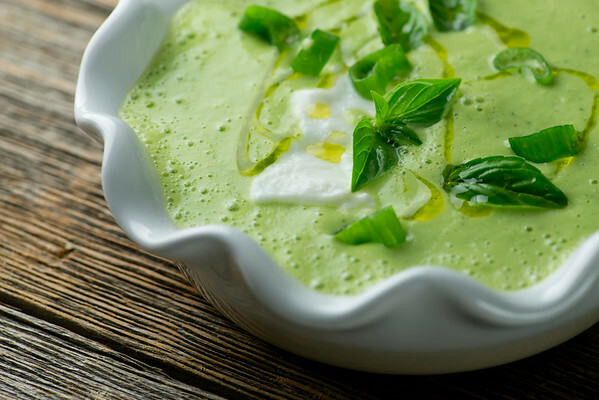 Turn it into soup with this cool and quick zucchini gazpacho recipe – the perfect summer soup! When I was a kid, my mom had a huge vegetable garden full of lettuce and tomatoes and pumpkins and green beans and peppers and other veggies. She is a magical gardener, and the item she always seemed to grow the most of was zucchini. Piles and bushels and mountains of zucchini. She made zucchini bread and zucchini pancakes and zucchini muffins, and my brother and I quickly learned that in the months of July and August it was wise to check anything we ate for stray zucchini. She is wily with the zucchini, my mama is. And so if there are any of you out there preparing for the annual summer zucchini storm, here’s a cool, quick gazpacho that features not tomatoes but…say it with me….zucchini! Don't know what to do with all that zucchini? Turn it into soup with this cool and quick zucchini gazpacho recipe - the perfect summer soup!Click to TweetThe other thing that I always have mounds of this time of year is basil, so I make this soup with a heaping handful of that as well, along with cucumbers, sour cream, a little olive oil, some scallions and a bunch of ice cubes. Pop all of that in the blender and push the button. 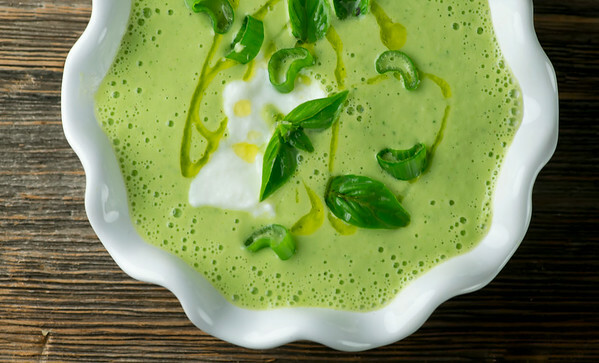 About a minute later you will have cool, green, summery, wonderful zucchini gazpacho. Add a little salt and pepper and you are ready to roll. I like to drop a little sour cream on top and scatter some of the little leftover basil leaves and a chopped scallion along with it. Drizzle a little olive oil on for prettiness, and you are ready to spoon it up. So when the zucchini starts looming? No fear. Zucchini gazpacho to the rescue! Put all ingredients except salt and pepper into a blender. Puree until smooth, adding extra ice cubes if you like the soup a little thinner and colder. Ladle into bowls and garnish with basil leaves, a little chopped scallion, a small spoonful of sour cream and/or a drizzle of olive oil. This is also great with some garlic and curry powder, love this summer soup. Thanks. Kate, Nice to know this side of you…have been following you and your recipes for a year or so and have been inspire many times! After drooling over this photo on fb, I finally made it last night and absolutely loved it. I actually made two batches. One just as written, and another more vegan friendly. For the latter, I did not add the oil and instead just added the equivalent on water. For the sour cream I added soft tofu. I made my family try both versions and they could barely notice a difference. We all loved how refreshing it was though still a nice filing soup for a hot summer supper! Thank you! Hi Sofia! Hurray, and I love your variation on it – will have to try that myself! I’m normally not super keen on red gazpacho…but a deeply green gazpacho stuffed with zucchini sounds so ideal. After encouraging others to make this I finally got my chance tonight. Love the texture and flavour. drizzled with a little garlic infused oil and enjoyed it sitting outside. Nice! Awesome summer gazpacho! Added unsweetened coconut yougurt instead of sour cream and a cup of room temperature chicken broth. Very savory! Thanks Vanessa! I love the coconut yogurt variation – I need to try that!